Mereseini is a 10 year old girl. Mereseini is one of 5 children and her Dad is a farmer. Her family's monthly income is little more than FJ$100, which means they have very limited funds for food, clothing and other necessities. 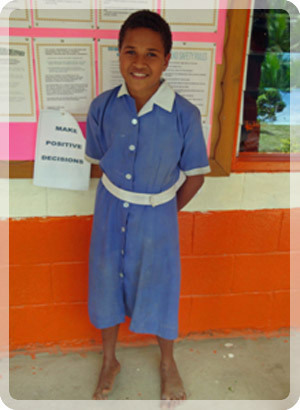 Mereseini enjoys attending school and her favourite school subject is drawing. When she is not at school she loves to swim in the river. Mereseini travels to school each day on foot, which is luckily only a short distance. When she grows up, Mereseini wants to work in a store in town. Mereseini is a very bright child who takes a lot of interest in her school work. She is capable of excelling in her life provided that she is supported financially. This child is from a very poor family background. There are 4 children attending school. So far this year she is unable to buy her school books. Mereseini now receives the education every child deserves.